Landscaping should be the last thing you do outside. It can be done anytime after all driveways, sidewalks, and patios (flatwork) are complete. rough-grade, topsoil, and final grade. If you’re planting trees, do that after topsoil and the final grade, but before laying of sod. Bedding plants and sod (or seeding) should be the last step. You can hire one landscape contractor to do the entire job. You can also hire separate contractors to do parts of it. You can do all or part of it yourself. Your local building inspector probably has no separate licensing requirement for landscaping, but you should verify that. 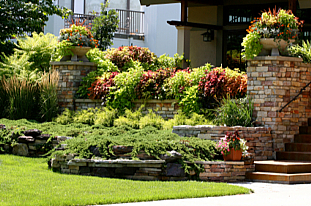 Don’t underestimate the value of a quality landscaping job. It’s one of the best things you can do to add value to your house. But don’t rush into buying a total landscape package without doing a lot of price comparison. 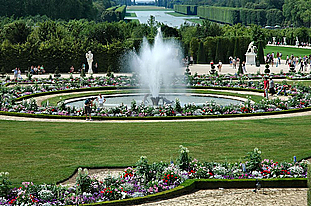 The prices landscapers charge can be hugely different. The big landscape/nursery companies will design a gorgeous landscaping plan for you, with a veritable rain forest of beautiful plants, trees, fountains, and babbling brooks as part of a total landscaping package. Exquisite. But get ready for a shock when you see the price. There’s nothing wrong with starting conservatively with your landscaping and adding to it, little by little in years to come. You’ll end up with a landscape that’s really beautiful and won’t strain your finances.